For other uses, see Fale. 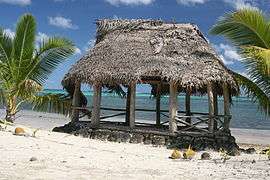 A beach fale is a simple thatched hut in Samoa. Beach fales are also common in other parts of Polynesia. They have become popular in tourism as a low budget accommodation situated by the coast, built with a few posts, no walls and a thatched roof with a round or oval shape. The word fale (pronounced fah-leh) is the Samoan word for any type of building. A similar word is used in other Polynesian languages, similar to whare in the Maori language. In Samoan architecture, these simple huts are called faleo'o in the Samoan language. They are common in villages where they provide extra storage or space for dragon boats. As the term denotes, beach fale are usually located around the coast in villages. In Samoa, renting out a beach fale to visitors is a common means for providing extra income for families. Interior of a beach fale. Looking out from a beach fale. 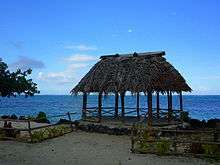 In comparison to beach fale, this is a large traditional Samoan house, fale tele which serves as a meeting house or guest house, Lelepa village, Savai'i Island.